The spine is simply another word for the vertebral column, and is an abbreviation of spinal column. It constitutes, therefore, a bony column made up of vertebra one on top of another, which are joined by fibrous intervertebral discs. The cervical vertebra are located at the upper section of the spine, beginning at the base of the skull below the neck. This section is made up of seven cervical vertebra, with the first two forming the superior cervical spine, called the atlas and axis. This section is characterized by its great capacity for mobility and very small-sized vertebra compared to the rest of the vertebral column. 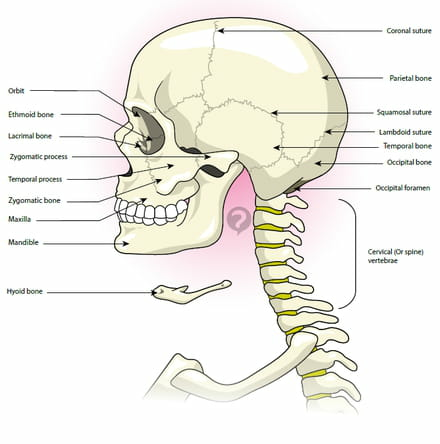 The cervical vertebra are curved towards the front, which is called the cervical lordosis. These vertebra support the head, but also protect the spinal cord and its nerve roots that emerge from it, essentially spreading to innervate the neck and upper limbs. This document, titled "Cervical vertebra - Definition," is available under the Creative Commons license. Any copy, reuse, or modification of the content should be sufficiently credited to CCM Health (health.ccm.net).